What is Irritable Bowel Syndrome (IBS)? 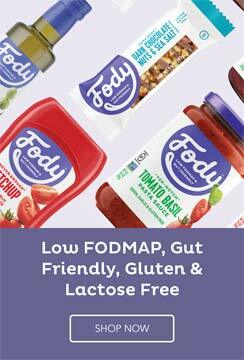 Personal 1 on 1 FODMAP diet coaching and weekly live Q&A calls from the comfort of your home. Suzanne Perazzini is a certified nutritional therapist and highly regarded IBS and FODMAP coach who suffered from IBS for two decades before she mastered her IBS symptoms with the Low FODMAP diet and began helping others do it too. 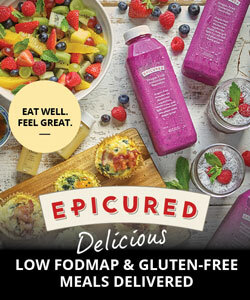 Suzanne has been featured on ABC, CBS, NBC and FOX via the debut of her Inspired Life Low Fodmap Coaching Program. Her program successfully delivers pain relief and a new lease on life for her clients and individuals just like you. If you’re tired of living in pain and at the mercy of IBS, then Suzanne’s Inspired Life Coaching Program is for you. You will be provided with all the tools necessary to solve your IBS symptoms while helping you increase your clarity, focus and direction in life. You’ll be handed a specific strategy and plan that solves your IBS symptoms and eliminates your pain. You will no longer question what kinds of foods you can eat and you will even learn how to eat while you travel and how to create foods your entire family will enjoy. All of this is done within a supportive online environment where you get results from the comfort of your own home no matter where you live in the world. You get personal 1on1 coaching while also being supported via Live Q&A calls each week with a small group of your peers. If you’re wondering if you truly can experience results, read the below testimonials of previous Inspired Life Coaching students who are experiencing life changing results because of Suzanne’s coaching. If you know you’ve not been able to get the results necessary to live life on your own terms, reach out to Suzanne at the below link and schedule your complimentary strategy call so you can discover what’s stopping you, slowing you down or standing in your way of IBS relief. There’s no cost to the call only the cost of living with IBS symptoms. Click here to find out more information. “Thank you again so much for all your care, help and support. I have found the course wonderful, educational and enlightening, and a definite inspiration to continue on with the Low FODMAP way of eating, to manage my IBS. You have given me so many recipes and ideas to keep it interesting and well balanced. And my tummy is very appreciative! “With the weekly menu plans, the many delicious recipes, the follow up with a daily dairy page, the encouragement, tips and advice in mails and weekly phone calls made it so much easier to follow the elimination diet. During these 6 weeks, I also fully realized that not only what you eat, but also stress management, relaxation and daily exercises are very important when one has to cope with IBS. And this approach makes the program quite unique. “My life with IBS was a daily struggle just to make it to the next day. Pain, medication, no answers and no hope that I would ever feel like a normal person again…. And then I met Suzanne online, purely by chance. It was one of the best things that could’ve happened. Here is someone who knows…. Someone like us that has been there and lived what we’ve lived. Someone who’s done the research and has the plan to help get your life back. 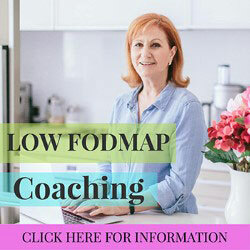 “The Inspired Life Low Fodmap Coaching program was the solution I have been looking for ever since I was diagnosed with Crohn’s disease. After trying many fad diets that claim they cure digestive inflammation, starting another one was very daunting for me. Suzanne helped me through every step of the diet with endless support. For the first time in my life I am not in pain after every meal and I feel more energized and healthy than ever before! She taught me how to create balanced meal plans that fit my very busy lifestyle, provided me with some amazing recipes, and gave me tips for managing the stress that makes my digestive issues worse. - Margaret Kneeland – in her 50s. IBS Diets is a participant in the Amazon Services LLC Associates Program, an affiliate advertising program designed to provide a means for sites to earn advertising fees by advertising and linking to amazon.com.